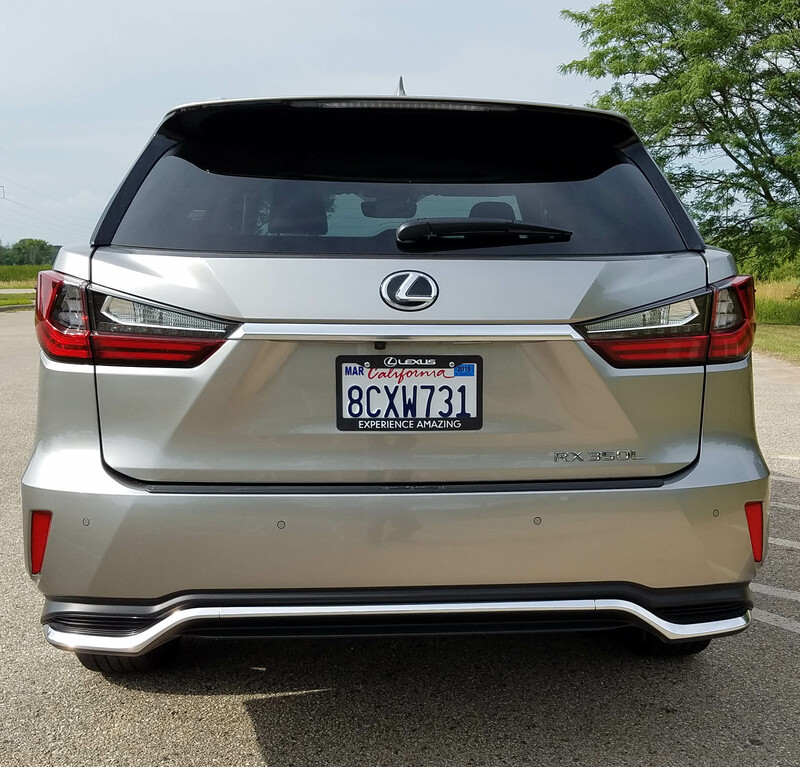 Lexus may have invented the crossover craze with its original RX model that proved to be just what the doctor ordered for suburban America. Well, that has not changed all these years later as the RX continues to impress and sell like cream puffs at the Wisconsin State Fair. For example, a few years ago Lexus introduced its awesome hybrid version that gets tremendous gas mileage. It sells well. 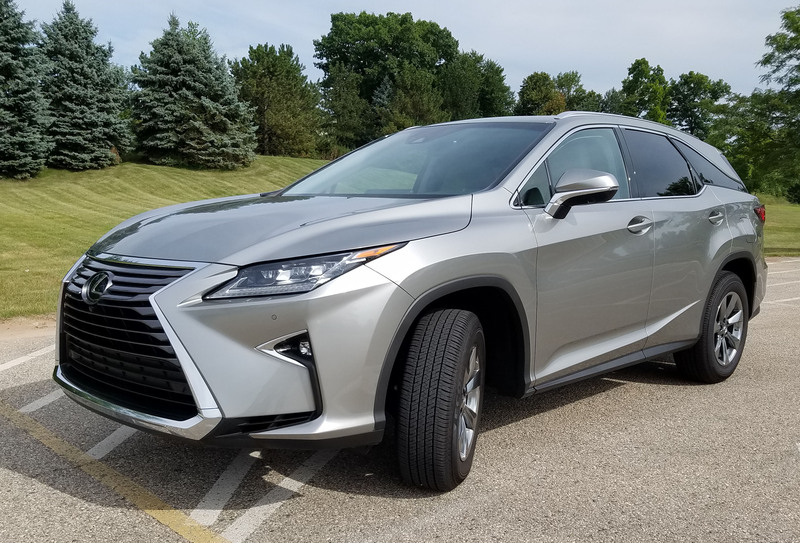 Now, for 2018 it has introduced the RX350L, that L meaning it’s longer than the standard RX by 4.3 inches and has a third-row seat to help cart around the soccer or swim team from meet to meet. If you are short of leg and don’t mind squeezing in with your seat mates for a short drive, this third row does its job. If you’re planning a cross-country trip with seven folks you’d be better off with a minivan or larger crossover, something like Subaru’s new Ascent that I tested a few weeks back. Yet you’ll not be more comfortable or pampered in many other vehicles than in the RX. It’s a champ of pampering and as quiet as any vehicle on the road costing less than $80 grand or so. 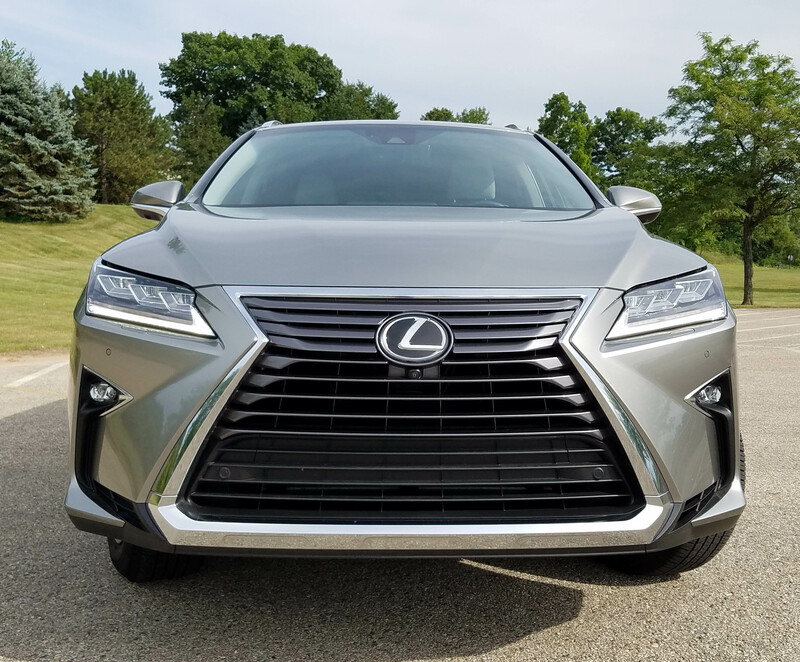 Power remains strong and smooth and quiet with Lexus’ stout 3.5-liter V6 that in the tested L version nets 290 horsepower. That’s down a piddling 5 hp from a standard RX because of its single exhaust, vs. a dual in the standard model. You won’t notice as the 8-speed automatic is so perfectly mated to the V6 that the RX jumps up to highway speeds and away from stoplights. And that’s just in Normal drive mode. There’s also a dial to tune in Sport or Eco. Sport firms the steering a bit and creates more responsive acceleration. It’s fun to use, when you’re in the mood for oomph, but Normal mode is fine for every day. Handling is precise and light, making the RX fun to drive, certainly more so than larger SUVs and crossovers. After being in a Range Rover and Infiniti QX80 this felt like a hot rod sports car. There’s no discernable lean in turns and the ride is luxurious, meaning smooth and well controlled. I wouldn’t change a thing. 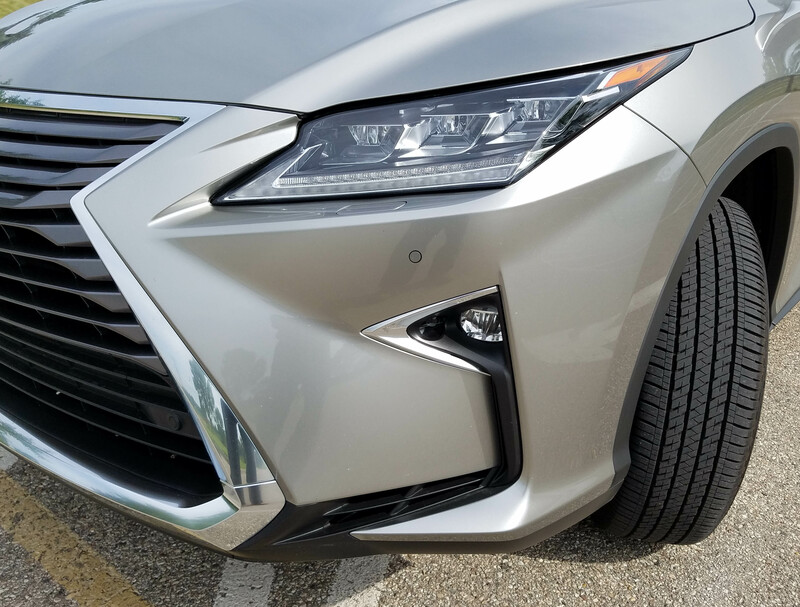 Braking is fine too and there’s plenty of safety equipment on the RX, starting with the standard Lexus safety system that includes smart cruise control, a pre-collision warning system with pedestrian detection, lane keeping and departure warning and assist systems, plus intelligent high-beam that dims or brightens your high-beams automatically. Slick! 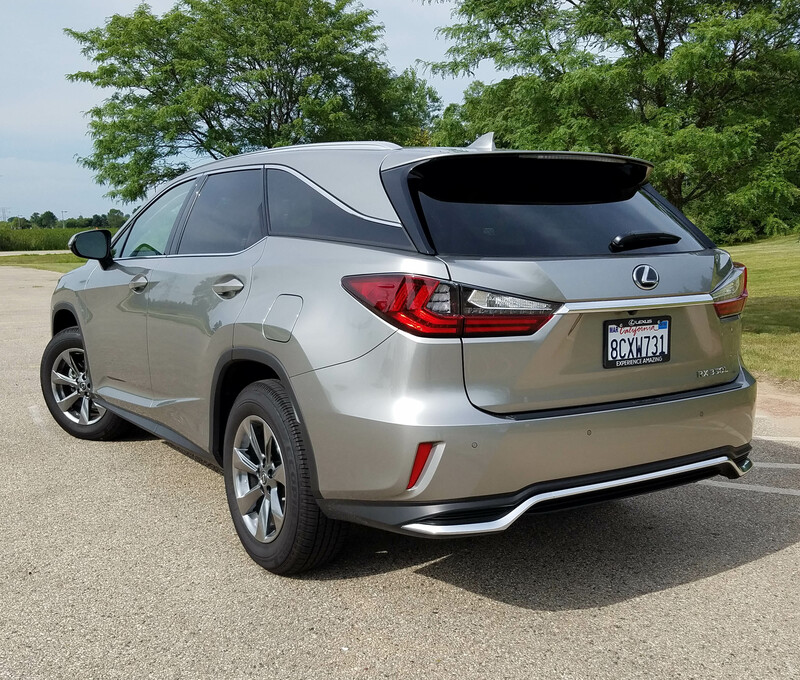 The only safety add-on here was a $1,865 package with a backup monitor (which is standard), but including a panoramic camera (really four) that makes it easier when pulling into and out of tight parking lot spaces. That package includes a blind-spot monitor and rear cross-traffic alert that also brakes the vehicle if it suspects an impending accident. All the monitors are needed too as the A- and B-pillars both are broad in the RX, sometimes making side views challenging. Always ask any front seat passenger to put their seat as far back as possible to improve your side vision. 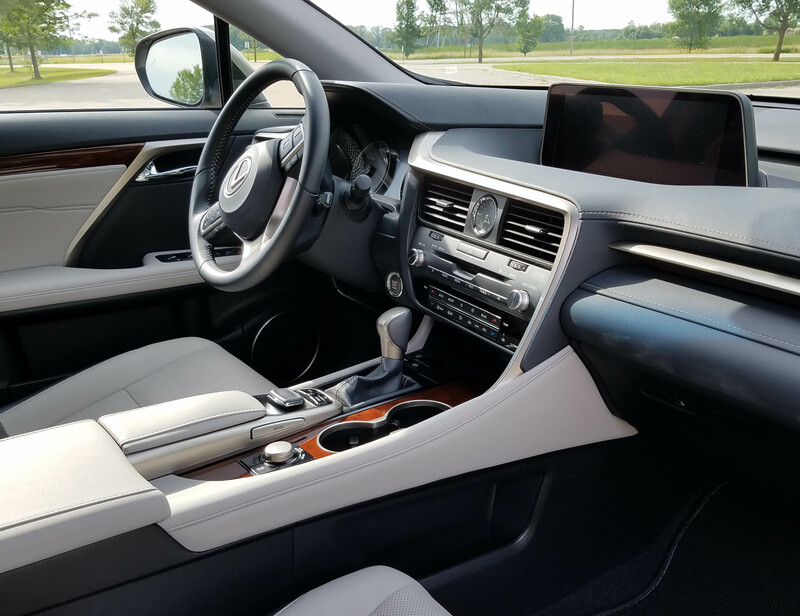 Inside, the silver RX test vehicle was well decked out with a charcoal over gray interior featuring gray leather seats, brushed metal trim on the dash and doors, a wood insert on the doors and atop the console and a thick black leather power tilt/telescope steering wheel. The second row is a bench and the third consists of two seats that can be powered up and down separately to hold additional passengers or cargo. There’s a power hatch in back too and this one was touch-free for $200 more, meaning you can activate it while just standing behind the vehicle. All the seats are comfortable to sit in, although as indicated earlier, foot and legroom is tight in row three. The front seats are mildly contoured on the bottom and feature well-contoured backs. A drive to Omaha last year in a hybrid model proved the seats comfy on a long road trip. The tested RX also included three memory settings for the driver’s seat, part of an $810 premium package. Sadly these seats were neither heated nor cooled. That’s a $640 option that I’d opt for. There also was no heated steering wheel in this model. The dash is clean and easy to see and figure out, although there’s still some clumsiness with the console-mounted mouse to move around the big touchscreen, which is about 12 inches. 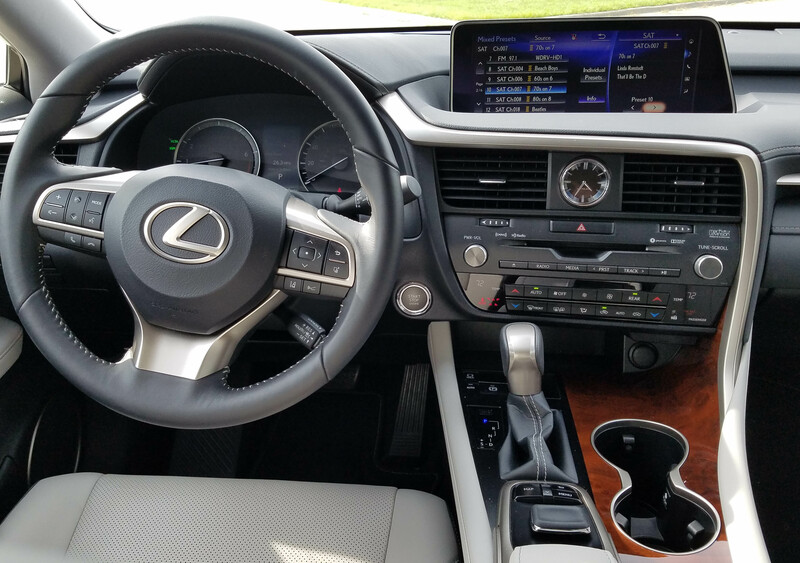 Wisely Lexus includes radio volume and tuning knobs on either side of the screen to allow for easy radio control now. There’s also a CD player, much appreciated by those of us with sizeable CD collections and no desire to buy a new i-whatever, plus headphones! There are plenty of electrical hookups inside the center armrest though, for folks who DO prefer to be electronically tethered to their vehicle. This model also added a navigation package with a monster 835-watt amp and Mark Levinson premium sound system with 15 speakers. It’s really nice, but will run you $3,200. Ouch! Overhead is a small sunroof. Wish a panoramic version was available. The sun visors also flip and slide appropriately and there’s a HomeLink system here too. A few other add-ons of note include the cold weather package, probably a good bet for Wisconsin buyers at $200. Most importantly it features a fast response heater to more quickly get the interior up to a comfortable temp. Headlight washers and rain-sensing wiper also are includes. You’ll notice those wipers and auto-leveling lights and light washers come in several of the packages, so only get the one you need. For instance all those light features come in another $1,515 package that also includes cornering lights. Lastly, this one added that moderately priced premium package that upgrades the interior look, includes roof rails, leather seats, day/night mirror, heated power outside mirrors and a rear seat armrest with storage inside. The result of all these options is that the tested L model moved from its $48,665 starting price, including delivery, up to $56,455. So you have some control over how strong you go into the luxury crossover market. Oh, and adding AWD here costs about $1,200 extra. 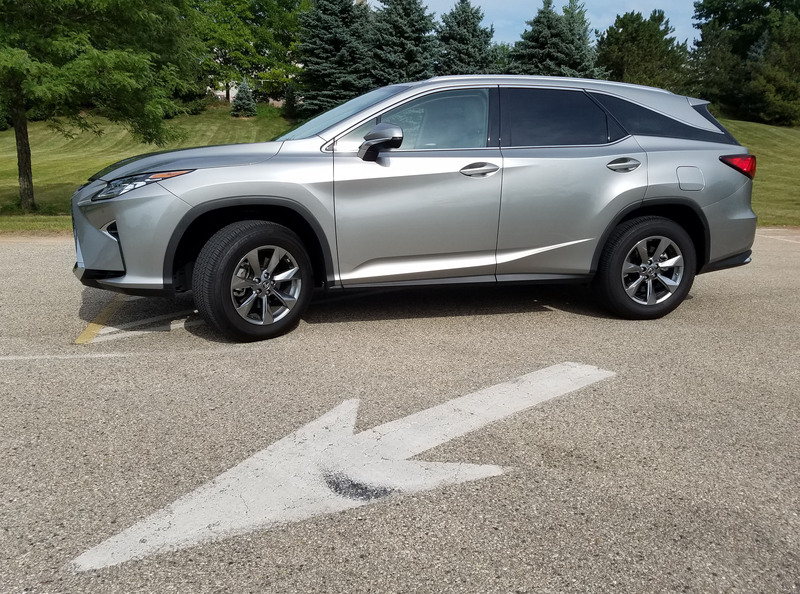 First consider the base RX350 with its 295-horse version of the V6, starting at $44,465 and the hybrid RX450h at $46,890. It gets 31 mpg city and 28 mpg highway, plus comes with AWD. The test vehicle was front-drive and managed 24 mpg in about 60% highway driving. The EPA rates it at 19 mpg city and 26 mpg highway. There also are F Sport models that make the crossover drive and look a bit sportier. The F Sport version of the shorter RX runs $50,115 for starters, while an RX450hL, the longer version starts at $52,250, again with AWD. Spend what you can afford, but you’ll be happy with whatever you choose. There are reasons the RX still leads the way in the midsize luxury crossover/SUV market. Hits: Power, ride, handling plus third row seat that power up/down, big info screen, clean dash buttons and controls, 3 seat memory buttons, comfy leather seats, rearview camera, sport driving mode. Misses: Heated/cooled front seats are optional, no heated wheel, small sunroof. Big A- and B-pillars make side vision a challenge at times.